When a disaster strikes, communities need to be prepared. Medical teams and equipment need to be dispersed, food needs to be distributed and shelters need to be arranged in a hurry – but undoubtedly, the most urgent need will be water. This week marks the 13th anniversary of Hurricane Katrina in Louisiana and the first anniversary of Hurricane Harvey in Texas. Reflecting on the far-reaching impacts of both of these storms, as well as the risk that communities across the country face each day, further highlight the critical need for clean water in large supply in a disaster’s wake. Preparation is key for municipal leaders and emergency preparedness managers. Humans can survive about a month without food; average survival time drops significantly when it comes to our essential need for water. According to Scientific American, less than a week without water can be fatal. The ability to distribute clean water during a natural disaster is crucial, and this ability depends on having reliable water purification systems ready and in place ahead of time. Reverse osmosis is among the best-known and most reliable solutions for producing drinking water during natural disasters; it is an efficient, practical, and cost-effective method for purifying water. Water is pumped in from an outside source. This water is forced across the semi-permeable reverse osmosis membrane, which filters out contaminants. Dissolved solids are removed from the membrane by the reject stream. Permeate water, which is clean, passes from the system on the other side of the membrane. 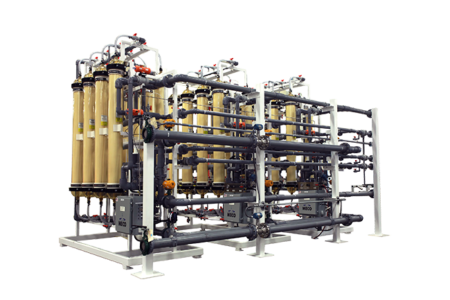 This system purifies and can render potable any type of water, which is why reverse osmosis is ideal for industrial water purification and disaster relief. The Centers for Disease Control (CDC) guidelines state during a natural disaster, at least one gallon of water is required each day per person or pet. The guideline is higher in warmer weather, and also increased for those who are pregnant or sick. At minimum, the CDC recommends storing at least three days’ worth of water per person or pet, though having a two week supply ready is ideal. On a larger scale, municipalities planning emergency management supplies with these guidelines in mind would be hard-pressed to source and store enough clean water to for every citizen in their city or town. During Hurricane Harvey in 2017, flooding rains disabled the city of Beaumont, Texas’s water supply infrastructure, leaving 118,000 residents without water. In these situations, where stockpiling water is impractical, if not impossible, a water purification system makes sense. To better understand what municipal water purification for disaster preparedness looks like, let’s review three communities, selected for their particular, size, location, and water needs. Elmore, MN: Located on the border of Minnesota and Iowa, this small town is home to between 600 and 700 people. Elmore is located in the Midwest’s infamous “Tornado Alley,” where spring means a tornado can touch down with very little warning. When tornadoes do touch down, the disaster event itself is brief, lasting minutes, not hours or days. However, disaster recovery can be a long process, as rebuilding of homes, utilities, and public buildings can last weeks, months, or even years. In Elmore’s case, an early spring touchdown impacting the town would leave residents nowhere to go for clean drinking water. The town would need to produce at least 1,500 gallons of clean water per day for several days to meet recommended guidelines for disaster preparedness. The total figure would be upwards of thousands of gallons of water over the course of the event. Golden Beach, FL: A prime example of a small town at risk of being hit by a hurricane, this community has fewer than a thousand people. The community of Golden Beach is located on the Atlantic coast of Florida, right in the sight lines of any oncoming storm. A major catastrophic event, such as a direct hit by a hurricane, would require the town to produce between 2,000 and 3,000 gallons of water per day. The daily water requirement per person is elevated to account for the area’s warm climate. Sourcing this volume of water direct could cost the community tens of thousands of dollars over the course of an event. 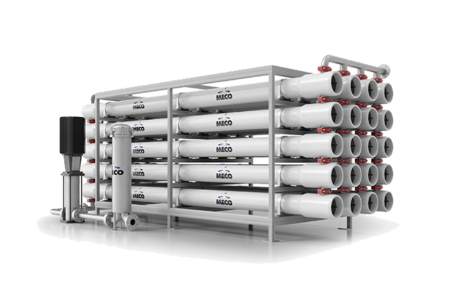 A reverse osmosis system offers an economically-friendly alternative. Houston, TX: During Hurricane Harvey, Houston was subjected to unprecedented amounts of rain, resulting in flooding that displaced tens of thousands of Texans. Hurricane Harvey represented a “perfect storm” situation: a major hurricane forming in late August, with heat and humidity driving up the required allotments of drinking water for impacted citizens. As the fourth largest city in the US, with an estimated 2.2 million residents, the city of Houston would have needed to provide at least 4 million gallons of water per day to adhere to CDC guidelines. Sourcing and storing water to accommodate the requirements for Houstonians would have been impossible. Some of these communities have firsthand experience with natural disasters, and others are proactively preparing for a future event. Having an emergency water supply system could be the difference between life and death for community members. What Type of Purification System Is Right for My Community? Reverse osmosis systems provide expedient, energy-efficient means of providing clean water to those who need it most. To determine the system you will need, consider the maximum number of people in your community who could need clean water under the worst conditions. For instance, if your community has 5,000 residents, you should calculate your needs if you had to provide for every resident at the height of summer. Produces clean, potable drinking water from practically any water source, including rivers, lakes, flood waters, the ocean, or wells. Units come completely packaged, minimizing the amount of installation work that needs to be performed in the field. There are classification options for hazardous areas. Spare parts are readily available, allowing quick repair and preparation for high-demand times. System designs are customizable, allowing municipalities can create a system that best fits their needs. 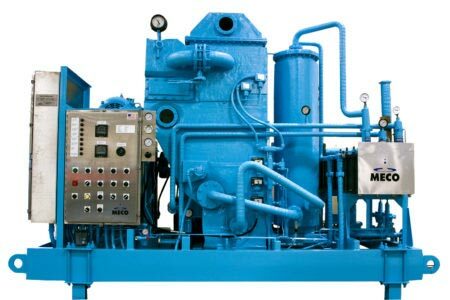 Varying system capacities are available – in gallons and cubic meters per day. The United States faces some of the world’s most extreme weather. Natural disasters result in loss of life and damage to property and essential infrastructure in almost every corner of the country. For municipalities, the primary focus when planning for disaster preparedness and emergency management is the minimization of tragedy. While it’s impossible to control the course of a natural disaster, community preparedness can prevent unnecessary suffering in the immediate aftermath. Hurricanes and tornadoes bring with them high winds, heavy rains, and airborne projectiles. These events, which occur primarily in the Midwest, Gulf Coast, and along the East Coast, can destroy public utilities and contaminate water supplies. When the storm has subsided, it is often up to the municipality to produce the needed water through emergency relief systems. Hurricanes Harvey, Katrina, Sandy and others have been notable in recent memory for the destruction they caused, as have tornadoes in Texas and the Midwest. Mudslides and forest fires are prevalent in the dry, mountainous regions western and southwestern United States. Mudslides typically occur when a steep mountain slope is waterlogged from a short spurt of heavy rainfall. Forest fires heavily effect the quality of drinking water, as forests are crucial parts of natural water filtration. The arid and semi-arid conditions in California, Nevada, and Oklahoma increase the probability of these events. Both result in the displacement and destruction of utilities that communities must be prepared to absorb. Floods are one of the most ubiquitous natural disasters across the United States because of the multitude of conditions that can cause them and the sheer unpredictability. For communities in Louisiana in the heat of the summer, a weather event as insignificant as a prolonged afternoon thunderstorm can lead to widespread flooding that impacts infrastructure. The impacts to public utilities, which can result in dehydration for stranded and displaced citizens. Heavy runoff contaminating drinking water, including public utilities and private wells. When this occurs, water must be disinfected for safe drinking. During flood events, the ability to filter water for distribution is paramount to minimizing casualties. Before a disaster strikes, cities, regions, and towns need to be prepared. A reliable reverse osmosis system for water purification provides a surefire solution in the event floods, earthquakes, hurricanes, tornadoes, mudslides, or fires contaminate municipal water supplies. Remember, even smaller-scale events, such as summer rainstorms, can lead to power outages that impact a citizen’s ability to to pump water from a well. An alternative source of clean drinking water is the first step in keeping communities functional and thriving at all times. The EPA offers many guidelines and resources for communities looking to prepare for natural disasters. Their Emergency Response Plan Guidance for Small and Medium Community Water Systems provides specific guidelines to aid in planning for disasters and national emergencies. The city of Jamestown, Colorado received EPA assistance with their rebuilding efforts following flooding in 2013. One of the most important first steps communities can take is creating a log of different organizations and people to call upon in natural disasters. This includes police, firefighters, officials in public health, operators of the municipal water supply and treatment of wastewater and state and EPA officials. Next, a community should consider practical aspects such as water purification measures. Reverse osmosis means clean drinking water for all members of a community who need it. 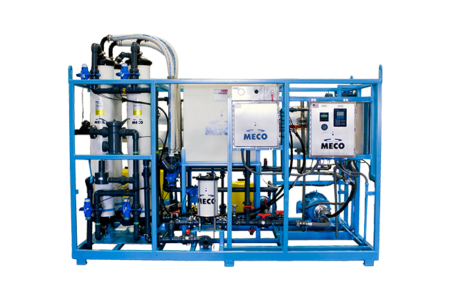 Single systems like the MECO MMRO-LT can produce between 8,450 and 33,800 gallons per day, or 32-128 m3/day. 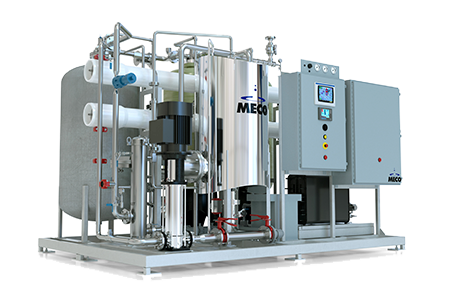 This output capability makes the MMRO-LT a mainstay in desalination plants and commercial industrial water purification systems. 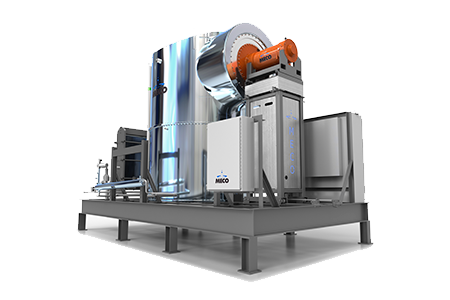 The same features make these systems perfect for purifying municipal water for disaster relief. Just one of these units can produce enough clean drinking water for many communities. Why Prepare for a Water Emergency? 1. Why Should We Prepare? In the wake of a disaster, how a municipality responds is critical. While some communities respond efficiently and comprehensively to disasters, others find themselves less prepared, which results in the loss of lives and property. Poor preparation at the municipal level can lead to significant crisis-related public relations and litigation issues. Even more damaging is the erosion of the baseline trust of the community itself. Disaster preparation planning, including investment in emergency water purification systems, signifies that municipalities care about their residents. 2. How Does It Benefit Us? Communities that are prepared are communities that draw people in. The way a city or town responds to natural disasters says a lot about its level of concern for its populace. Think of it this way – would you rather move to a town that handled an emergency in a lax or amateur way or a town that responded to a disaster with expert expediency and organization? Additionally, reliable disaster relief makes a town’s current residents more loyal to the place. Knowing they will be taken care of is likely to retain people — knowing they are on their own in the event of an emergency is sure to make them consider moving elsewhere. Think of investing in municipal water purification as part of a “ground-up” infrastructure policy. Municipalities need to be able to handle the worst scenarios before they can provide the best standard of living. Being able to provide residents with clean drinking water during an emergency should be a top priority of a municipality, and the investment is sure to pay off with just one disaster. In the event that a disaster occurs, it is vastly more cost-effective to produce water through reverse osmosis as a long-term solution. It is the unpredictable nature of disasters that makes them so devastating with daily needs like water. The cost-effectiveness of reverse osmosis goes hand-in-hand with preparedness in general. 4. What Do We Have to Do? Be aware of the risks and signs of impending danger. Ensure the community is knowledgeable about insurance — including flood insurance — and that it is mandated where necessary. Develop an action plan for how to handle disasters. Assemble resources for community supplies, including water purification for clean drinking water. Create a network of volunteers and specialists such as emergency medical providers, EMS, firefighters, search and rescue teams and others. Implement the plan, and ensure all steps are executed accordingly. Perform rescue missions if necessary. Distribute clean drinking water to all residents who need it. Assess performance, and improve areas did not work as well as planned. The same principles of disaster preparedness also apply to businesses. Unpredictable events like tornadoes, earthquakes, fire, or other natural disasters can during the workday with little to no warning. Proactive preparation can provide peace of mind for you and your employees. Business owners should consider calculating the water supply needed for their teams in accordance with the same CDC guidelines of one gallon per day, per person, with appropriate additional considerations for seasonal extremes and pregnant or sick employees. 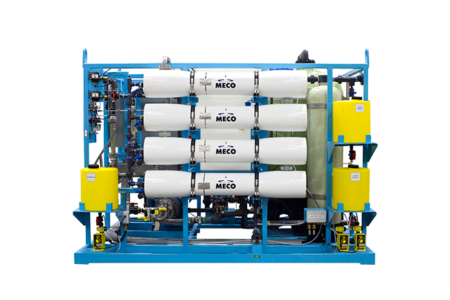 MECO manufactures state-of-the-art reverse osmosis systems ideal for disaster relief. 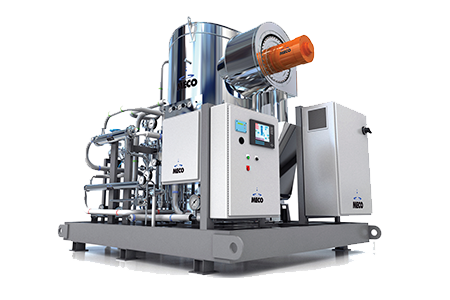 Our systems lead the industry in terms of output, efficiency, longevity, and lack of maintenance. 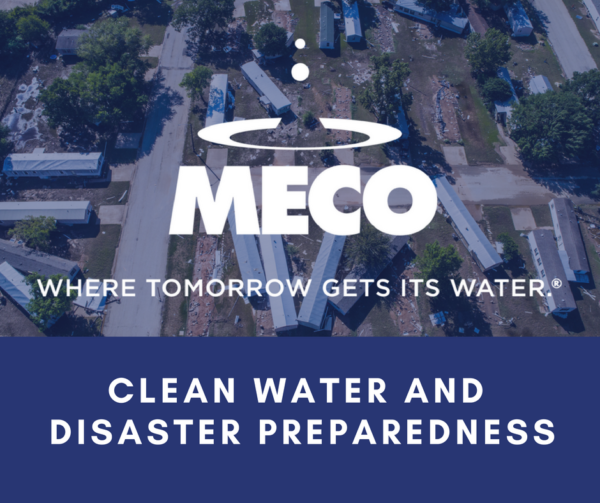 Whether you’re preparing for emergency disaster relief for a community or a business, MECO offers the best water purification systems on the market. 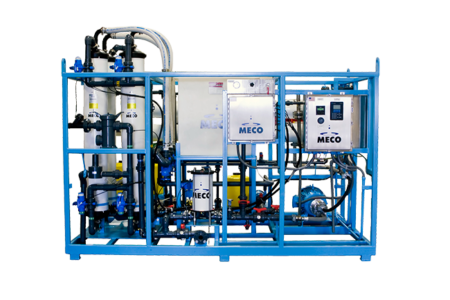 A broad product line of technology and extensive experience enable MECO to bring valuable and sustainable solutions to our clients. 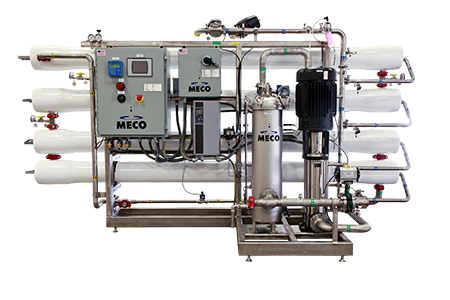 Contact MECO today for questions about innovative and efficient water purification solutions.